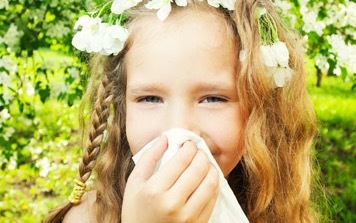 2 million people in the UK suffer with seasonal allergies. Generally speaking, early symptoms are caused by tree pollen, and later symptoms are caused by grasses and weeds. This is known as seasonal allergic rhinitis (or more commonly referred to as hay fever). In response to exposure of an allergen (e.g. pollen) the body’s immune system overreacts and releases chemicals (histamines) which cause inflammation. Histamines work quickly, causing sneezing, itching and runny nose. The eyes may also be affected, with itching, redness and watering (allergic conjunctivitis). Other chemicals released during this overreaction can cause a blocked or stuffy nose and sinuses, which may lead to headache and difficulty sleeping. Rhinitis is often regarded as a trivial problem but studies have shown that it severely affects people’s quality of life. It disturbs sleep, impairs daytime concentration and the ability to carry out tasks, causes people to miss work or school, and has been shown to affect children’s school exam results. (Source Allergy UK). Treatments that suppress the symptoms of rhinitis or hay fever are antihistamines. Quercetin is a natural anti-histamine i.e. it is known to inhibit the manufacture and release of histamine. It is also high in antioxidants. Quercetin is an flavonoid (plant pigment) commonly found in fruits and vegetables, especially onions, citrus, and apples. In this new supplement, Quercetin and Nettle complex, it is blended with other ingredients (such as nettle) to have a synergistic effect. Nettle is known for antihistamine affect too, but also believed to be soothing and anti-inflammatory for skin problems such as eczema, hives, redness and itchiness. Other ingredients include bromelene which is an anti-inflammatory (found in pineapples). Reduces swelling/inflammation in the sinuses. And liquorice – this also has anti-inflammatory properties but also has de-stressing qualities. Since over-the-counter and prescription antihistamines can have side effects like drowsiness, seizures and dry mouth, our natural option is a good choice. Use with Vitamin C for an optimal effect. Zinc also helps with hayfever. Zinc reduces histamine levels and will enhance Quercetin. 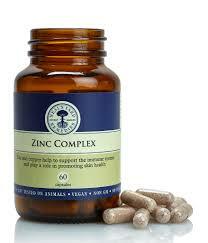 If you suffer with regular colds/infections – you could well be deficient in zinc. Zinc will reduce a cold by up to 7 days, because it is toxic to viruses. Zinc is amazing for skin – crucial skin healing and repair, acne, blemishes etc. balances sebum. Zinc balances the reproductive organs so it’s a great choice for couples wanting to conceive. Great for bones and nails. NYROrganic zinc has a great base of carrot, alfa alfa and bilberry. No fillers. Eyebright herb for reducing inflammation around the mucus membranes. 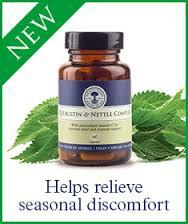 Nettle and liquorice (already mentioned above). Plus peppermint to calm and boost immunity. TOP TIP: Pop the used tea bags into the fridge and then place on the eyes for calming itchiness. 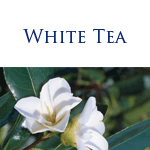 Any of the White tea range will be hugely antioxidant so great for any allergies/hay fever. White tea facial mist – lovely and refreshing, and cooling for the face. Use as a toner and as a facial spritz throughout the day over make-up. White tea toning eye gel. Again this contains the Eyebright herb for reducing inflammation around the mucus membranes, more specifically the eye area here. Keep in the fridge for that extra cooling effect. White tea enriching facial mask – the kaolin clay cools and calms the skin. Apply the bee lovely lip balm around nostrils to prevent the pollen/allergens from entering the nasal cavity. Some people with an allergy to pollens (especially tree pollens) may be affected by cross-reactions between their pollen allergy and certain foods. For example, they may find that when eating certain fruits, vegetables or tree nuts, especially raw, they get an itchy mouth or throat. Keep windows closed when indoors. This is most important in the early mornings, when pollen is being released, and in the evening when the air cools and pollens that have been carried up into the air begin to fall to ground level again. Get some reflexology. Reflexology Lymph Drainage has helped others manage rhinitis.